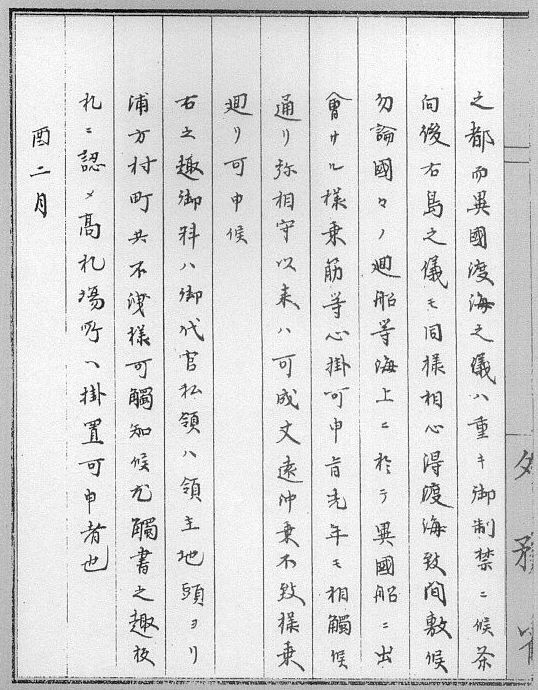 The following page describes a Japanese historical document that recorded a trespassing incident involving Japanese merchant named Aizuya Hachiemon. He operated a cargo-vessel business in Hamada, Iwami (石見?濱田 today’s Hamada in Shimane) under the feudal domain of Hamada. To the right, is Aizuya Hachiemon’s monument. He was executed for trespassing onto Chosun’s Ulleungdo. To help the ailing financial situation of his domain, he ignored the travel ban to Takeshima (Ulleundo) and conducted illegal contraband trade. Some say that he even traveled to Southeast Asia. Okada Tanomo (岡田?母), who was the chief retainer of the domain, and Hashimoto Sahei (橋本三兵衛), a financial official, silently approved Yaemon’s illegal activities since the profits from the trade was enormous and actually saved the domain from going bankrupt. “…Why are these records important..? 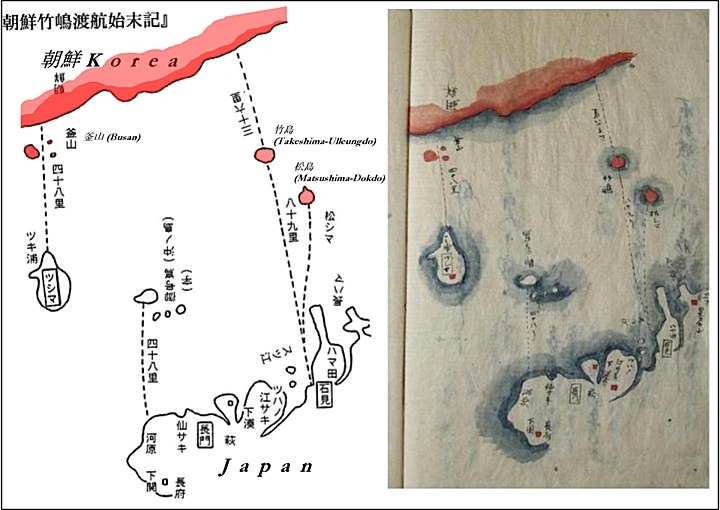 Although this record does not mention Matsushima, (Dokdo) the maps and documents that detailed the trial of Aizuya Hachiemon do in fact prove that the Shogunate’s ban on voyaging also extended over Dokdo Island. 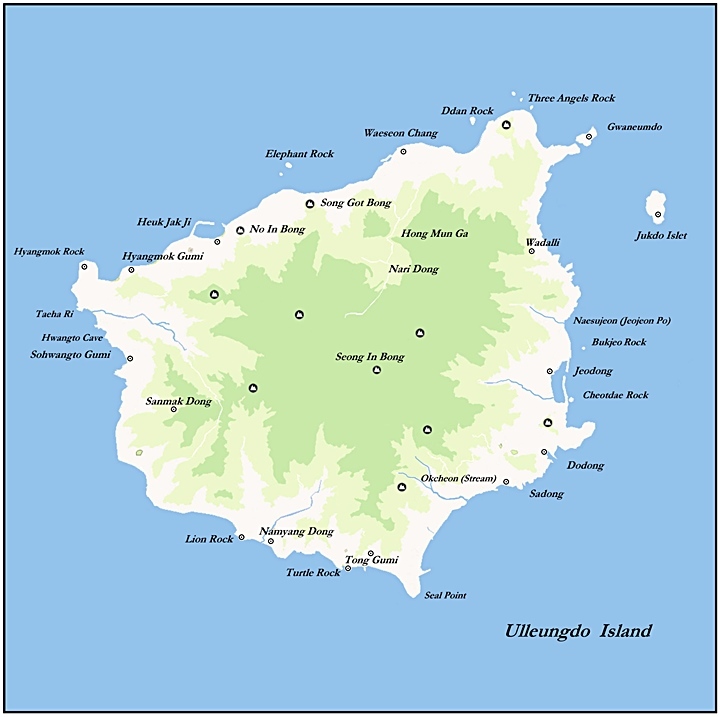 But first some maps to familiarize reader with the Ulleungdo – Dokdo region. Related Maps of Aizuya Hachiemon’s Trial. 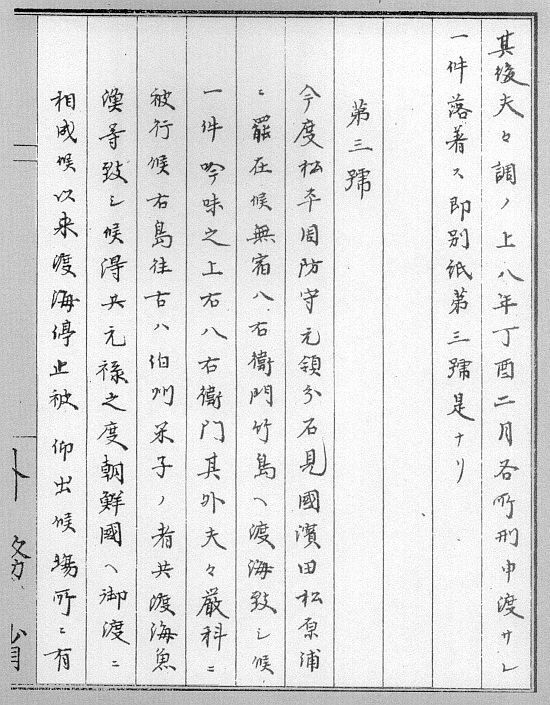 The above records that mention Japanese were not allowed to voyage onto Ulleungdo because it was declared Chosun land in 1696. However, because Hachiemon lied about voyaging to Dokdo (Matsushima) the Shogunate made it clear Japanese citizens were also banned from voying to Dokdo Island. From this fact, we can conclude the Japanese of the day considered the islets Chosun territory. The related maps can be seen below. 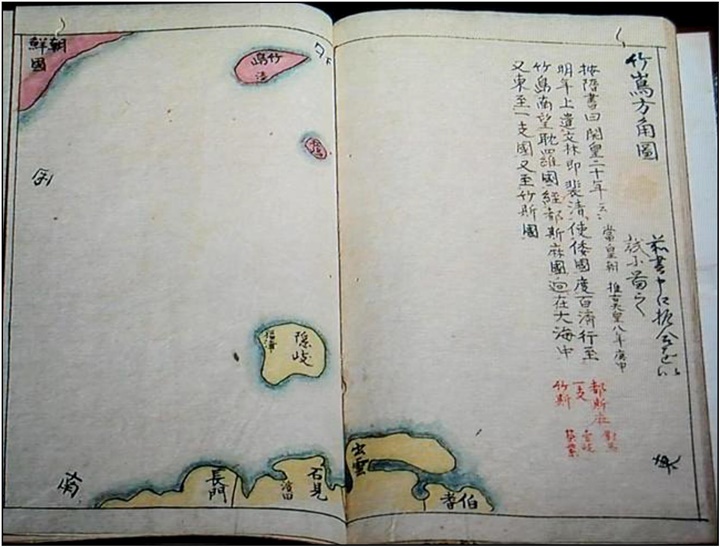 Around the year 1696 Japan conceded Ulleungdo Island (Dokdo’s closest neighbor island) was Chosun territory. The above paper shows how serious the Japanese government was about restricting the travel distance permissible for Japanese nationals in the East Sea. As quoted the document warned Japanese not to stray too far it also restricted them from coming in contact with foreign vessels. Dokdo Island has little or no fresh water and could not offer adequate mooring shelter from the storms that frequent this area. 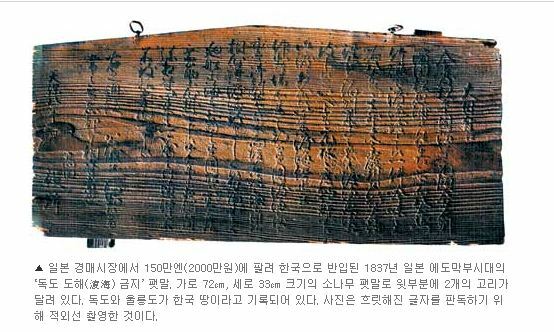 Records also show Dokdo Island was about three days travel from Yonago City against both prevailing winds and ocean currents. Thus, it made no sense for Japanese to visit only Dokdo Island. It also could explain why an explicit travel ban on these distant, desolate rocks wasn’t initially declared in 1696. In reality, there are no Japanese historical maps or records that show Japanese visited Dokdo as a sole destination but only as a stopover when trespassing onto Chosun’s Ulleungdo. 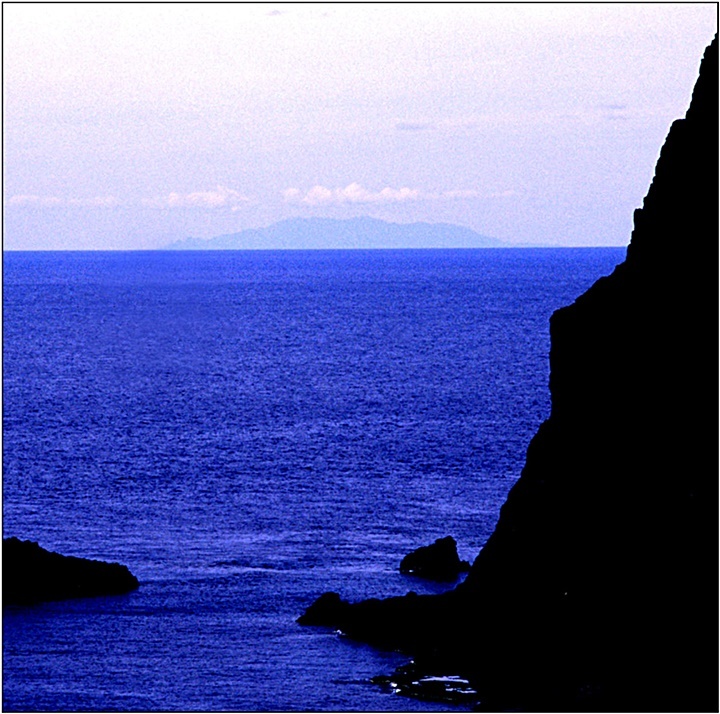 The image to the right is of Korea’s Ulleungdo taken from the shores of Dokdo Island. The images above are wooden signposts demanding Japanese nationals stay off of Chosun’s territory, not to voyage far and to even avoid contact with foreigners. To the Japanese, Dokdo’s value was only related to what fish or forestry products they could reap from Ulleungdo. In light of this document, it is not plausible the Japanese Government considered Dokdo Island of any value during this era let alone part of Japan’s inherent territory as they now assert. Here it’s also clear, as with earlier records, Japan maintained a hands-off policy in the Ulleungdo – Dokdo area at this time.